There have been vines growing in Britain for over 50 million years. The success – or otherwise – of the native wild and imported cultured vine has largely been determined by the prevailing climate. During the Roman occupation and into the Mediaeval period the warmer conditions in the United Kingdom enabled vines to flourish only to decrease again during the mini Ice Age of the 15th to 19th centuries. Today, as witnessed by the large number of successful vineyards in England and Wales, the vine is again doing well. Roman culture at the time of the occupation certainly included plenty of wine-drinking and, undoubtedly, they brought wine with them. 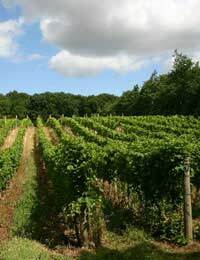 Whether they actually planted vineyards in England is less certain although there is recent archaeological evidence to suggest that they did attempt commercial vine-growing in the Northamptonshire area. Britons at the time enjoyed mead and ale made from easily-available local produce and, even if they’d begun to get a taste for wine, the long period of invasion that followed the relatively peaceful Roman occupation provided little opportunity to settle and establish vineyards. French monks, experts in wine-making, crossed the channel with William the Conqueror, along with the Norman noblemen who expected wine with their meals, and by the time of the Domesday Book in 1046, there were at least 42 vineyards throughout southern England. Some were attached to monasteries, others the property of the crown or nobility. However, trade with France and Spain increased in the first centuries of the new millennium and imported wine was in plentiful supply reducing the need to grow one’s own. Wine merchants in London and Bristol became known for their expertise in refining and improving the port, sherry and claret that entered the country. The dissolution of the Monasteries in 1536 and the changing climate of the time have both been blamed for the next major decline in the British wine industry, and, apart from a notable exceptions, it wasn’t until the twentieth century that there was a serious revival in UK vine-growing. Lord Bute was a wealthy and enthusiastic industrialist who invested much time and money creating a vineyard at Castell Coch in south Wales at the end of the nineteenth century. After doing his homework – or rather sending getting his head gardener to France to find out the whys and wherefores - he planted the first three acres of vines in 1875. The last good vintage to come out of the Castell Coch vineyard was 1911 and the vineyard went out of production shortly after the first world war. There are three names that will crop up if you’re talking about the history of twentieth century wine-making in England and Wales: Ray Barrington Brooks, Edward Hymans and Sir Guy Salisbury-Jones. Shortly after the second world war Ray Barrington Brock set up a research laboratory in Oxted. He dedicated himself to studying vines and working out which of the approximately 600 varieties he tested would grow best in the UK. Edward Hymans raised public awareness of the English and Welsh wine-making industry through his writing and broadcasting. His books, The Grape Vine in England and Vineyards in England (which he edited), are industry standards that are invariably found on the bookshelves of anyone seriously interested in pursuing vine-growing. Sir Guy Salisbury-Jones was responsible, in 1951, for planting the first commercial vineyard in Great Britain since that at Castell Coch. Based at Hambledon in Hampshire it grew well and the first wines went on sale in 1954. There are approximately 400 vineyards in England and Wales commercially producing wine. They range in size from less than one acre to the 265 acres of Denbies vineyard in Dorking in Surrey. Many vineyards provide wine-tasting opportunities and some are promoting themselves as tourist attractions with guided tours, restaurants and shops with some even offering bed and breakfast. Denbies English Vineyard is open all year and has regular special events for all the family, including Lego exhibitions and craft and story-telling sessions for the children. Renishaw Hall & Gardens In Derbyshire, until 1986, could boast the most northerly vineyard in the world. The home of the literary Sitwell family, Renishaw, has its own museum, gallery and famous Italianate garden. Ryedale Vineyards, to the north-east of York, are the most northerly commercial vineyards in Britain. A newcomer on the scene, the environmentally-friendly vineyard offers farmhouse bed and breakfast accommodation. Camel Valley Vineyard in Cornwall won the International Wine Challenge trophy for best sparkling rose in the world (including champagne) in 2010. Ideally situated on the Cornish peninsula the vineyard runs guided tours and tastings, and also offers self-catering cottage accommodation.